This post originally appeared on October 7, 2006. The passage of time has not changed my views, although I have bowed to familial pressure and will be roasting a young dead turkey on Sunday afternoon. I have a confession – I don’t like turkey. Actually, I don’t like the whole turkey dinner thing. 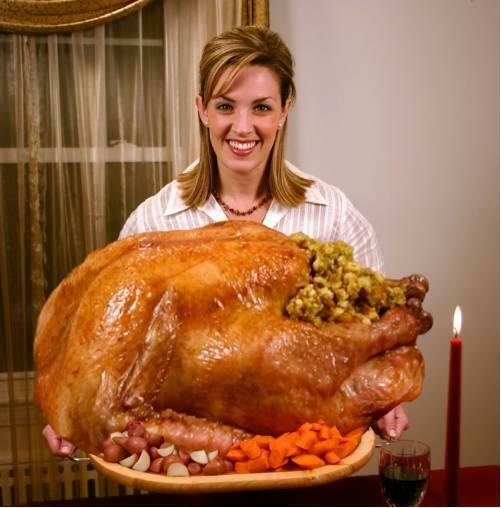 Turkey is not one of those foods that I ever get a craving for. I don’t come home from work and think “Man, I could really go for a roasted turkey tonight”. Luckily the consumption of this dreadful bird is mostly limited to Thanksgiving and Christmas. It’s not that I won’t eat a couple pieces of white meat if offered. I’ll graciously choke down a couple of dry pieces so as not to offend. And by the way, I’ve cooked a turkey breast-side down, it was still dry. Stuffing? You’ve got to be kidding. Little pieces of damp bread that you cram into the body cavity of a big dead bird and then scoop out the back end after hours of roasting? Who thought that was a good idea? I’ll pass on the gravy too, thanks. And no, please don’t offer me any of that jellied cranberry sauce from the can. Save your squash, your turnip, sweet potatoes, and other starchy sides. Now with most dinners, I can at least look forward to dessert. Not at Thanksgiving. Dinner wouldn’t be complete without pumpkin pie, the only kind of pie I have encountered that I don’t like. At least it usually comes with a bit of whipped cream that I can lick off.